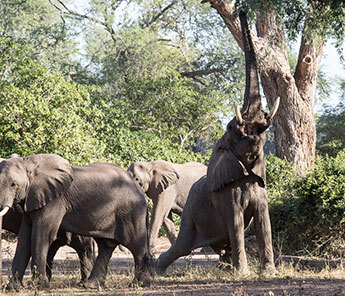 At the end of June 2016 we were lucky enough to be given the opportunity to travel to Gonarezhou National Park in the extreme south-east of Zimbabwe to do some intensive sound recording for a special project. Our luck improved further when a good friend and veteran traveller from the USA was keen to join us in revisiting this favorite spot and so we chartered directly from Johannesburg into the Mahenye airstrip (via Buffalo Range for customs and immigration) near the lovely Chilo Gorge Safari Lodge - our home for most of the stay. 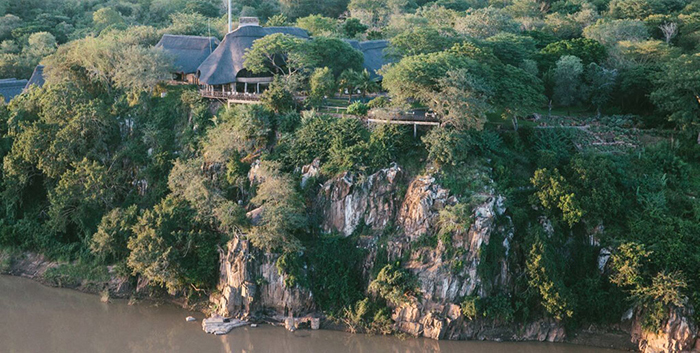 Chilo is certainly one of the most stunning lodges in Zimbabwe, set on the top of a cliff with a magnificent view of the Savé River below and the national park on the opposite bank. We were delighted to spend time with lodge owner and internationally recognised guide, Clive Stockil and his partner wildlife artist Lin Barrie, who were on hand to provide extensive assistance with our project. Our first morning started in the amazing sand forest on the edge of Mahenye Village. 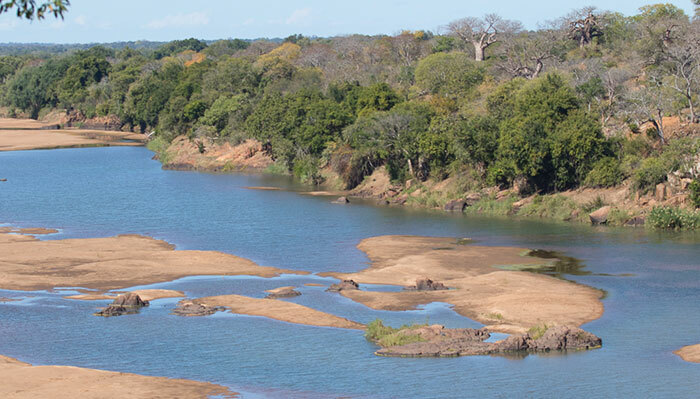 This is one of the premier birding destinations in Zimbabwe and we were hoping to find a few of the special species that have recently been recorded here. Unfortunately cow bells and other domestic stock noises from the village did not lead to successful sound recording but we did find several Green Malkoha’s, an African Broadbill and a Gorgeous Bushshrike. 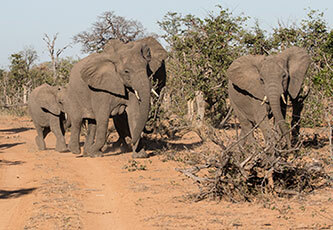 In addition to the birds we found tracks of a large group of elephants that had fed there during the night. Then we headed for Mayenye Island for more recording; and it was obviously a laundry day with women from the village going about their chores paying little heed to the many crocodiles that were sunning on the riverbank a short distance away. Chilo Gorge Lodge is closely involved with the local Mahenye village and visitors can enjoy the riches of Shangaan culture and see the promise of a sustainable future. Our first drive into the park took us towards the Savé/Runde rivers Junction which, at 162 m asl, is the lowest point in Zimbabwe. 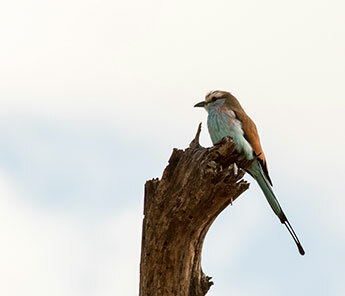 A Racket-tailed Roller perched on a bare tree in the woodland provided us with some fabulous photo opportunities, closely followed by one of our most amazing elephant experiences ever – a group of 16 adult elephant bulls slowly making their way towards the river and sand forest on the opposite bank (pictured at the start of this newsletter). The next day we headed for Chilo’s exclusive new Mahove Tent Camp set on the banks of the Runde River, deep inside the park. Head guide Thomas Mutombeni looked after us for the first part of this excursion; stopping in a variety of habitats to set up the recording equipment and let it run for 20-30 minutes at a time while we drove off, hoping elephants and baboons wouldn’t find the equipment and “investigate"! 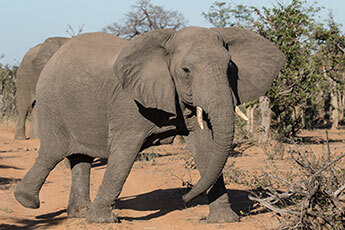 The first bit of excitement was a group of elephants on the side of the road which included several large bulls that were showing considerable interest in one of the young cows who was obviously in oestrus. We spent quite some time sitting quietly on the edge of the group watching the behaviour before moving down the road to set up the sound equipment. A couple of the youngsters trumpeted their annoyance at our departure, upsetting the rest of the herd but they soon calmed down (with calves fast asleep on the ground) and on our return we estimated that there were now around 20 bulls spread over several hectares and presumed that there must have been several oestrus cows to attract such a large number of potential suitors. We came across a large herd of buffalo with one bull displaying in front of us, pacing up and down confirming his dominance while we were parked nearby. 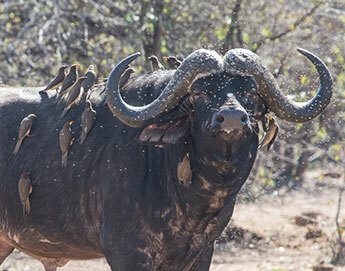 He had a huge number of Yellow-billed Oxpeckers all over his body and an unbelievable number of flies buzzing all around his head. 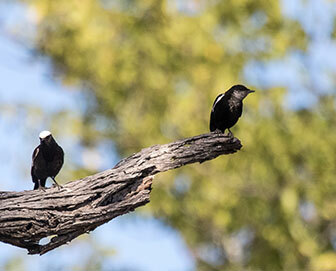 A pair of Arnot’s Chats provided more photo opportunities as we passed through some cathedral mopane woodland. By midday we reached our campsite and settled in. The camp is located in amongst a grove of huge riverine trees that provide plenty of shade during the heat of the day and overlooks the Runde River. 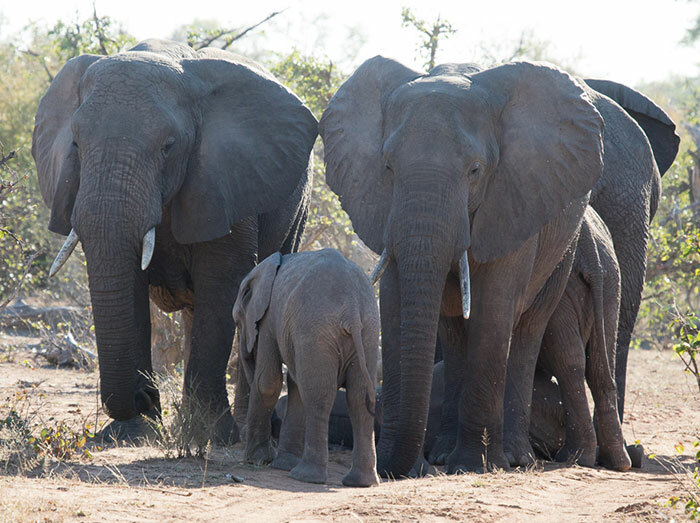 In addition to an estimated population of around 11,000 elephants, Gonarezhou is also famous for its massive baobab trees and together with a large Ilala palm grove, they dominated the vegetation around the camp. We were very excited to have a resident Collared Palm Thrush in camp and got some great sound recordings of this attractive little bird calling right next to our tent. The following day we were able to photograph another very obliging one close to camp. Now we were able to get both predawn and post dawn recordings fairly close to camp but still far away enough to avoid the camp sounds. 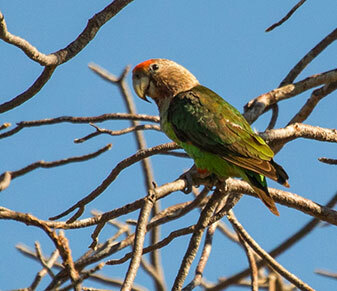 Both Grey-headed and Brown-headed Parrots were common alerting us to their presence with their piercing shrieks and we found on pair with a nest hole in a huge baobab. A target bird was the Mottled Spinetail which breeds and roosts in another massive baobab close to Tembwahata Pan but although we found several flying high up in the sky at dusk we were unable to get photos or sound recordings – perhaps a mission for our next visit? On day three at Mahove Camp we were joined by Clive and Lin and during recording sessions we looked for birds and butterflies whilst Lin added to her array of wonderful baobab paintings. There was extensive grass cover along the top of the Murhumbini Hills that attracted several herds of buffalo and a surprising variety of flowers that provided welcome nectar for the many butterflies. On our way down the hill we stopped off at the Savé/Runde Junction for a tea break and Clive casually mentioned that when he was last there he spotted a Pel’s Fishing Owl in the tree above us. 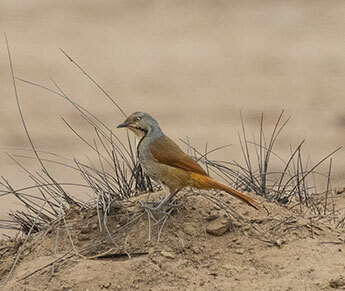 After a few minutes of careful searching, much to our excitement there it was – one of Africa’s “most wanted” birds! 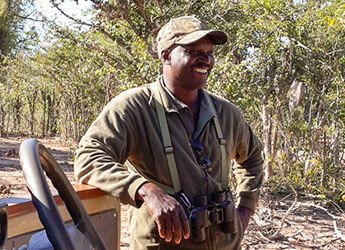 The sounds of the bush really do stir the soul and evoke a sense of place - here is a short dawn chorus from Chilo to enjoy.